Australia Dairy Company, often misspelled as Australian Dairy Company, is by consensus the most famous cha chaan teng in Hong Kong. To sum up my experience in two sentences, this place has the best scrambled eggs that I have ever eaten in my life. Unfortunately this is also the place with the worst service ever, period. I live for scrambled eggs. It is a dish that I would hunt for to the ends of the Earth. As such I was quite sad that Australia Dairy Company was closed on Thursday – which so happened to be the day that I landed in Hong Kong. I went down with my partner to the famous cha chaan teng on Friday morning, and there was already a long line outside at around 8:30am. The queue moved very fast though, and the apparent 30-minute wait was over in 10 minutes. For those that don’t understand Chinese or Cantonese, ordering from this place can be a nightmare. The one thing that tourists will have to get used to in Hong Kong is the bad service. For some of the more popular eateries, it is not that the waiters ignore you or forget your orders – they actually scold you when you take a bit more time than the average local. They never smile and they have this perpetual unwelcoming vibe. You feel like… they hate you. I must emphasize that I had some pleasant experiences with service standards in Hong Kong, so it is not all doom and gloom. But if you are a visitor from a westernised country, prepare yourself for a culture shock. Given the service reputation of this particular eatery, we had prepared well in advance. We knew what to order and how to order it. However, we still failed. Their main breakfast set had the default item 双蛋 (shuāng dàn), which actually meant two sunny-side up eggs. You had to change them to 炒蛋 (chǎo dàn), or scrambled eggs, which was their signature item. The waiter had tried to say this impatiently for a few seconds, but the distinction was lost on my partner who was not a native Cantonese speaker. We ended up getting served with two plates sunny-side up eggs, which I had to request for an exchange to their famed scrambled eggs. As you can imagine, I was scolded quite badly for changing the eggs, but they did it nonetheless. Their breakfast set by default comes with two sunny-side up eggs and toast, macaroni soup and choice of coffee or tea. You must change the eggs to scrambled eggs. All this for a cool price of HK$32. You have to add HK$2 if you want to change your drink to a cold one. This is it, this is perhaps one of the best scrambled eggs on the planet. I have gone around Singapore searching for the best scrambled eggs, but nothing compares to this. Good scrambled eggs must have the perfect balance milk and butter, with perhaps a small amount of cream. My best guess is that Australia Dairy Company has added some kind of salty seasoning to their scrambled eggs giving it a deliciously potent kick. That coupled with the perfect texture and softness makes me give this item a rating of 4.8/5. Simply brilliant. Pure perfection for a ridiculously cheap price. You could say it more than made up for the bad service that I had to experience earlier on. My previous all-time favourite scrambled eggs was served at a top hotel in France. I dare say that the Hong Kongers at Australia Dairy Company have done better. If you’d rather skip the macaroni soup, you could just straight up order their scrambled eggs on toast or 炒蛋多士 (chǎo dàn duō shì) for HK$17. You will get a larger serving of scrambled eggs served right on top of a piece of toast. I am not a fan of macaroni soup so I will reserve my rating on it, but I did meet a fellow tourist elsewhere who enjoyed the macaroni soup. It is served with slices of ham. We ordered this item hot. Unfortunately both of us found this item unexceptional – it may have been better served cold. Our palates are used to a very high standard of tofu pudding (豆花 dòu huā, commonly known as tau huay) back in Singapore, and we prefer the typical tofu pudding to this steamed milk pudding. We rate this 3.5/5. The Hong Kong style milk tea (奶茶 nǎi chá) had a strong black tea fragrance, with a lesser portion of milk than we were used to. It is a matter of taste and at the beginning of our trip we preferred Gong Cha’s version of it back home. However, towards the end of our stay in Hong Kong, the taste grew on us and we would be craving milk tea after a long day of exploring Hong Kong. We do not feel that the milk tea at Australia Dairy Company is anything special vis-à-vis the milk tea elsewhere in Hong Kong, but nonetheless we will give this a solid 4/5. I am no stranger to coarse manners, having holidayed in Shanghai a couple of years back. But I was left scarred by the shocking service and rudeness experienced here, and in a couple of other establishments in Hong Kong. Would we come back here and subject ourselves to the traumatic service? YES! The scrambled eggs are to die for. Unfortunately due to the insane number of food places to eat in Hong Kong, I could only come back here one more time, and it was an unsatisfying take-away. They may have picked up scrambled eggs from their former colonial masters in England, but take it from someone who has stayed in London for a year – they have surpassed the English by leaps and bounds. If you only have time to eat one meal in Hong Kong, the Australia Dairy Company is your choice. 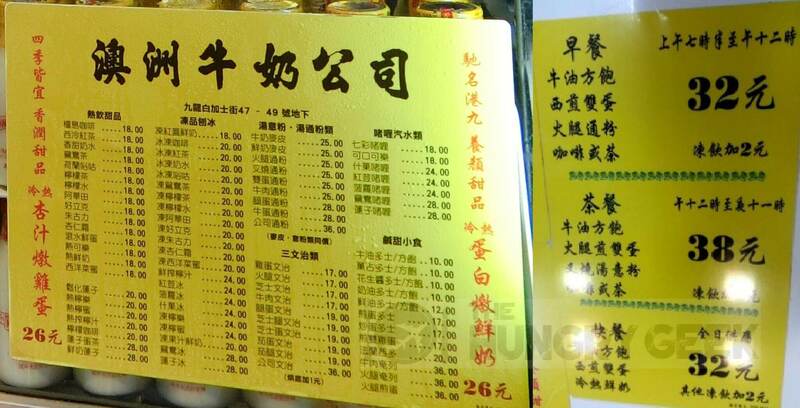 Tsui Wah Restaurant 翠華餐廳 In "Hong Kong Cha Chaan Teng"
Sun Wah Cafe 新華茶餐廳 – Satay Beef Instant Noodles In "Hong Kong Cha Chaan Teng"
2 Comments on "Australia Dairy Company 澳洲牛奶公司 – Scrambled Eggs"
Then how to order the food if no one speak mandarin or cantonese? My mandarin is quite rusty though. You can try speaking English, they actually do have an English menu – but be prepared for some rude treatment!